Dana Air has introduced more flights options from Lagos to Abuja and Abuja to Lagos with low fares. According to a statement by the airline’s Media and Communications Manager, Kingsley Ezenwa, starting 18th March 2019, the airline will operate additional flights from Lagos to Abuja at 6.48am, 10.08am, 12.15pm, 13.44pm, and 5.10pm while flights from Abuja to Lagos will be at 8.28am, 10.35am, 12.06pm, 15.30pm and 18.50pm. ‘’We are pleased to announce that we have introduced additional flights on our Lagos- Abuja –Lagos routes to provide more options, comfort and affordable fares for our teeming guests. Having yielded to the demands of our guests for more flights to be introduced at specific time and the increasing loads on the sector, we advise our guests to also plan their trip, book early by visiting our website www.flydanaair.comto get best fares. 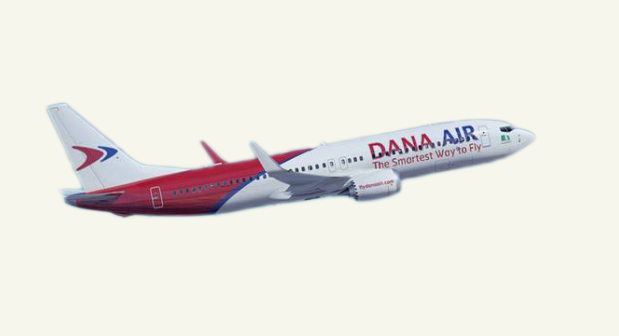 Dana Air is one of Nigeria’s leading airlines reputed for its world-class in-flight and customer service, innovative online product and services and unrivaled on-time performance.